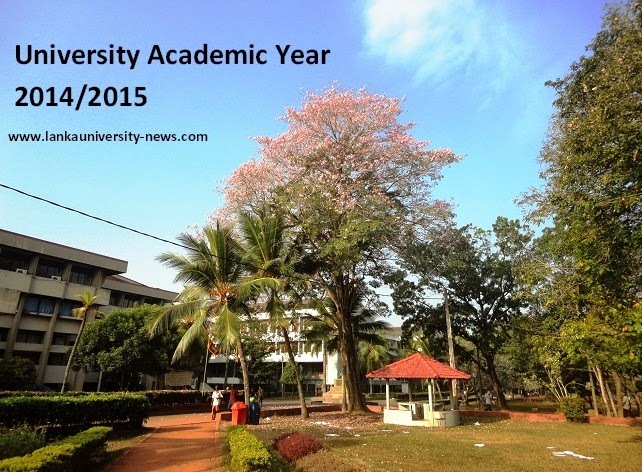 2014/2015 University Academic Year students read this full article. Sri Lanka University Grant Commission UGC has started to send University Admission Letters which mention your selected university, degree course and registration dates. Those who have qualified to enter universities based on issued Z-Score cut off marks will get the letter in future. UGC will admit students to universities under Special Admission. Under that UGC will intake students under several categories, Blind, Differently abled students,Sports,Music & talented students, Teachers, Armed Forces members, foreign students & Additional Intake. Students those who have marginal z-score Cut Off Marks will get registration letters depend on the availability under Additional Intake (Boat -Bottu). Academic activities of Medical & Engineering faculties will start 2015 November end. According to the reliable sources other faculties(Management, Science, Arts) will start within 2015 December to February 2016 period. After University Admission Letters, students will receive Campus Registration Forms, Mahapola / Bursary Applications, Hostel Registration forms and Medical Forms. University Leadership Training Program will Not be held this year. English Language Teaching Units (ELTU) will be established in each university. English Clubs will be established under the ELTU in each university letting undergraduates to master their communication skills in English. Students those who have issues and problems with University Entrance, Z Scores, Cut Off Marks, Aptitude Tests can get further details using below mentioned HOT LINES & Telephone numbers. Students - Call 1918 & Get Experts' Advises to Higher Education & University related Issues. Don’t hesitate to call UGC or Higher Education Ministry to get detail as they are very friendly and helpful. Students can get expert advice and can solve your all academic problems. Also students those who have problems with Z score and Degree changes should send an Appeal to the UGC in written. Students should forward a written appeal to the UGC along with the documentary evidence in support of the appeal. A photocopy of the appeal application form in the UGC admission handbook could be used as the appeal format. We "Lanka University News" will publish two articles about "University sub-culture" and "How to earn money while studying" in near future. Stay with us. How to obtain the application form to make an Appeal? A photocopy of the appeal application form in the admission handbook could also be used. What are the instances, that a candidate could not make an appeal? What are the reasons that can be considered by the Appeals Committee? Applicants who fall within the declared minimum Z score for a particular course of study but not selected, subject to provisions made in section 9 in the admission handbook. Applicant who has been selected for a particular course of study, but consider that they qualify to be selected for another course of study indicated by them, subject to provisions made in section 9 in the admission handbook. Applicants who request that they be assigned to another university. Applicants who request that their course of study be changed to another course of study for which the requirements for admission have been fulfilled. (In order to consider appeals for a change of course of study there should be a vacancy in the relevant course of study. Students’ order of Z score will be taken into consideration when there are more applications than vacancies). What is the time period in which a candidate could make an Appeal to the UGC? How to make a request for inter university transfer or change of course of study? Candidate who seeks an inter university transfer or a change of course of study, should get him/herself registered with the university to which he/she has been assigned in the first instance. Then the candidate has to forward a written appeal to the UGC along with the documentary evidence in support of the appeal. Is it possible to change the university and the course of study to which the candidate has been assigned? Yes, but there is no guarantee that every request for inter university transfer or change the course of study will be accommodated. What is the method of determine the applicant’s district for university admission? The district of any candidate (whether school or private) will be the district of location of school in which the candidate was enrolled (on the basis of school records) for the highest number of days during the three-year period ending on the last day of the month immediately preceding the month in which he/she sat the G.C.E (A/L) examination to qualify for admission even in case of having proof of residence in another district for a period more than the days he/she was enrolled in a school specified above. However, the district of a candidate who has been enrolled in a school/schools for a period of less than one year during the three-year period stipulated above will be determined on the basis of the location of school/schools which he/she had been enrolled, permanent place of residence of the candidate and other evidence as decided by the UGC. Did you get admission form? Not yet. I m waiting for it. I got it. I hv slct for mortu QS. When is the reg date. Where must we go for the reg. Ugc or relevent university. Im also slctd 4 fshn dsgn in uom. Im from kurunegala. Where r u frm?? I got all admision,registration & mahapola forms. Do you have to send it online or fill the form that you got? Have u noticed the form in UGC website ? Registration wladi sch leaving certficte eka oneda?? Registration Letter eke ehma kyla tynvda?? Online ywnnth register wennath puluwn application 1 post krnnath puluwn. Danatanm mrtu uni 1 ayta withrai letters awith thiyenne. Lst yr 1 nm regi wenna uni ekta ynnane thibune ethakota schl leaving crtfct 1 illala thibuna. Me para application 1 snd krnna withari thiyenne wena documnts illala na. Apata nm reg wenna dead line octbr 21. Api uni eke regi weddi e documnts illai. Eka nisa kokatath ewa ready krgnna. Sry dr online regi wenna ba. Applictn 1 registr post krnna thiyenne. Danata japureth letters enna aran. Uni eke reg wenakota leave illanawa. should we reg in online ugc / relevant university? Yes .. i noticed relevent form. Friend in my opinion, students who can pay relevent fee through online banking are filling online ugc form. But they must get a printout of receipt and regist.post with university letter.then they will register you.university registration will held on near future. all candidates or online candidates will reg online ugc admission form ? I don't know that.u 'd better ask that from ugc. Nuwara eliyen science faculty select ayata letters lebunada? Bottu enakota march witara weida science? Hiii. Mama kurunegala. Bio. Z 1.2158. Mawa select wela tiyenne auruwedawalata. Mata bio science bottuwak eida? Plzz tell me. Ane mamath 1.324 mama illuwe colombo peere japura bio witarai.danata agri busns mngmnt ruhuna selected.mama eekatath kamathy.anyway mata bio japurawath bottuwak eida.galle. Mcnla ugc site eke thiyenawa neda link ekak api select wela thiyena course eka n uni eka balanna. Man eke mage index number eka type karama waradi kiyala enawane. Kaage hari thawa ehema wenawada. Plz tell me what is the link.? Can we see our selected university.? mama course eka nam blw.eth university eka balanna tanak nene?dilini kohomada blwe? thnkz dilini.mn blw.eth mata tama letter eka awe ne.oylt awda? oya bottu gena mnw hari dannwaada? Bottu ganna appeal karanna ona na ne. Etakota dan not selected kenekta bottuwak awot eya e course eke inna kamati nam eyata appeal karanna puluwanda bottu walata salakannepa kiyala thawath?bottu enakota appeal dana antima dawasa ewarai ne eth. bottu walata appeal krn one ndd? dn mama ahu wela tyenne applied sciences wlata.eth mama bio yanna tynwnwm asai.mata ekt appeal krnn plwnd? Appeal karanna eka hethuwak newei. Oyage z eka bio walata tibila ekata noteruna nam appeal ok. Dan ibe bittu en ona. Have you anyone get forms for Biological Science yet? One of friends got japura bio. Mama galle bio 1.324 danata agri business mngmnt select.mama bio illuwe colombo peere japura witarai.mata boat ekak labeida . Have you got reg lerrers for engineering in Moraruwa?plz reply. Na mta thama na.. ei ane apita letters parakku? mama colombo district walin bio science kale.z eka 1.2412 tynwa.danata ahu wela tyenne applied sciences.DR eka 940.mata bio science walata bottuwak hambenna idakada tynwd?ane kwr hari reply karanna. kwr hari reply karannako plz. Matath ee prashnemai.1.324 bio boat ekak eida. oya z ekt nam ei aniwa. Yaluwane pera art kauru hri innawada....? mama arts nam nemei.eth arts ayage letters late wnw neda? Ow yalu late wnwa, but pera art december rejister kranawa mn dnna vidiyta,e nisa godak late wn ekak ne, oya art nemei nan mokadda course 1k.? Perada select.? Ok....yalu., art nounata ekama bach ekene..
Friends oyalata letters awa nam nikanma letter awa kiyan nathuwa dgree course ekai,university ekai danna amathaka nokara.eka loku udauwak thama letter awe nathi ayata..plz..
Uva wellassa letter awa aya innawada? Me link eken open wenne na ne something went wrong kiyala enne.oya mokadda dgree course eka? Friend kawadada ugc ekata forms fil karala yawan ona antima dawasa uve ? Monada eka gana dana ganna one? Mth arts. Thama dnna ktawatma ewit ne.. art eddi parakku wei dr..
Ok'dr.... Thanks for yr rply. Have u got reg latter 4r Bsc nursing in jaffna.? Oyg district eka mkakda? Ane plz kiyanda mt thawama awe nane letter eka. uva wellassa Export Agriculture Select ayata letters awada? Uva serama dgree walata ekama kale letters enne man hithanne.matath dana ganna ona uve mokak hari dgree ekakata letter awa kenek innawada? mata tea technology walata ltr eka awa. Uve 2014/15 fb page eka wada nadda? Oyata forms fil karala ewanna kiyala tyna antima dawasa mokadda? AQT wala job market eka kohomada? Bio krpu kata hari ada letters awada? 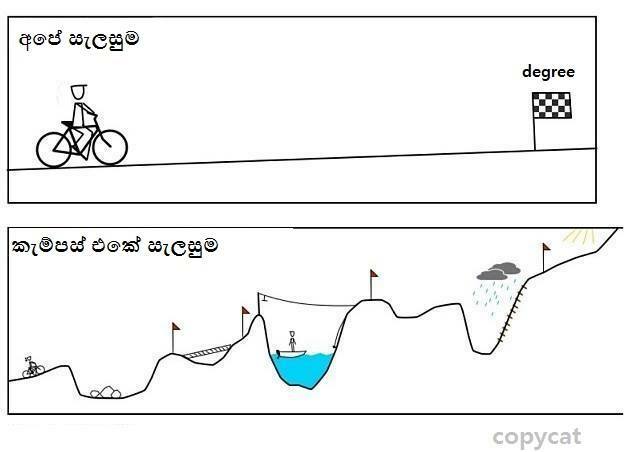 Engineering Moratuwa/Peradeniya/Ruhuna - Kata hari liyum awada ? When did you get your letter? When is the dead line? Engineering online register wennatha kiyala thiyenne? What is your district and island rank? Danata kisima course ekakata not selected ayata appeal karanna puluwanda ?kynnako..purappadu walata salaka balanna kiyalai appeal karanna ona.ehema puluwanda? ati yanthma letter eka awa. I got the letter AGRIC BUSINESS MANAGMENT.Ane galle 1.324 mata bio japura bouttuwak eida please. Bio science select vela letter eka ave nathi aya innvada? Letters awe nathnam mkada karanda ona? Commerce ayata admission letters thama awe na neda? Ucsc computer science aya dannawa nam kiyannako kawada wage apita patan ganida kiyala..
2013al walin gatta ayata patan gatte 2015 feb wala . Oyalata feb ta kalin patan gani. Ucsc ekata call karala ahanna. Admision letter eka yawwata passe thawa letter ekak enawada? Kawada witarada? Mage admission deadline oct 23 .thawa goda kaalayak yaida register wenna. Art kata hari letters awada yaluwane..? Naha dr thawama....oyage district mokadda kiyannako.mn badulla. Oyala hithanne khe wage set wei kylada..
Mamath hithanne pera.. Wage setwei kiyala dr. Math art thma latr eka awe ne.awoth reply krnda. Physical Science select wunu kata hari Admission letter eka labunada???? plz tell me....Sci Faculties patan ganne February da???????? can I enter CMB Sci Fac? Vavuniya campus eke applied select una kawru hri innawada????? Arts walin japurata kelaniyata ahu wenne z kiyen wagedaa.. Anyone plz reply me. Mn hriyatam nan danne ne yalu, but 1.4... uda aya ahu wenawa.giyapara 1.46 ganaka kenek j.pura ahu una. Oyage z.eka ehema thiyenawa nn smaharavita j.pura set wei. Kelaniyatath ehmda. Thanks yalu reply klata. Dr... Can u tell me'what's yr district & z-s? Plz.......I'm badulla. I m kurunegla. 1.39 wht about u dr.
Sripalee eke mass media ayata letters awa da? Ai a mgt ayata tama letter naththe..
mama colombo district walin bio science kale.z eka 1.2412 tynwa.danata ahu wela tyenne applied sciences.DR eka 940.mata bio science walata bottuwak hambenna idakada tynwd?ane kwr hari reply krnna ikmnt plz. Kalaniya hari ruhuna hari aniwaarenma eewi .mokada 1.1 gananwalatath ruhuna kalani aniwarenma enawa.mata thiyena prashne mama ee dekama illuwe naha.colombo peere japura witarai z eka 1.324 .eeka nisa matanam dan loku balaporoththuwak na. oyt hdtm sure da mata ahu wenna plwn kyl.mama clmb,pera,japura,kelaniya,ruhuna okkotoma demma.oyt sure da mata ahu wenna plwn kyl.mama habai clbm walin liwee.z eka 1.2412.DR eka 940.plz reply me. Dont be afraid .okkoma dammanam kohomath ei. Uva wellassa closing date kawadda kiyannako. mata thama ltr eka awe ne. mage z eka 1.24 arts bottuwak eida ? 1.3 z-s thiyena ayath battu enakan balan innawa yalu.... Khm weida dnnaha. Matath oya prashnemai thyenne. Mama adath ltr enakan balala UGC eken ahanawa. Oyage course eka mokadda? Application awa dr.. meke bank slip eke reference no eka kiyla ahanne mkakda? Oyala Kata hari physical letter awada? thama na friend.UGC site eke online reg karanna puluwan courses walata witharada letter labila thiyenne?? physical kiyanne degree ekak,NDT kiyanne diploma ekak. Ane manda hitaganna baa dr. Physical 3year out unot wadak tiyeida? oyata physical letter eka awada? ABC chem.bio.phy galle 1.324 rank351 mama bio illuwe colombo peere japura witarai.boat ekak eida. Giya para nam Galle 1.1 lamayekuta pere bio bottu awa. What.are you sure because last year my friend got 1.30 but he had a boat from japura bio.